Indium metal is a soft and malleable metal (like lead) and resistant to corrosion. It is typically used in alloys with metals such as gold, silver, copper, cadmium and tin. The choice and proportions of these different metals will determine the characteristics of the resulting alloy. Because of its low melting point (156°C), Indium metal reduces the melting point of the alloy, making it suitable for low-temperature soldering and manufacturing. It is also used for fire safety systems in public places, where its low melting point ensures that sprinklers are set in action rapidly when required. Other common applications are in avionics, radiotherapy, flat screens and for fusibles. Metaconcept Group offers Indium metal and its alloys in a variety of forms. 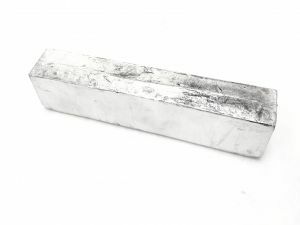 We can supply ingots of either pure metal (suitable for manufacturing your own alloys) or a number of standard alloys. We can also manufacture particular alloys based on your specifications. We also supply bars, flat bars and billets, which may be better suited to your needs. In addition, we supply preforms in a variety of shapes such as squares, rectangles, disks and rings, optionally with flux already incorporated, which may be a better starting point for your projects.To reduce the environmental impact of the industry we also have a recycling department which can collect and recycle not only Indium metal, but also used baths, off-cuts, scraps and white metal oxides.